We’ve tried our best to articulate our product strategy and we’ll keep doing so until we get everyone on the same page. You can use Gridgen to setup, launch, and view the results of your overset grid assemblies. For more information see http://www.pointwise.com/overset. Gridgen is alive and kicking. The current production release from August 2010 includes coupling with overset grid assembly, a major new feature suite. And as I write this, we’re adding baffle support to T-Rex (anisotropic tetrahedral extrusion) for resolving wakes and thin surfaces. Expect its release in February 2011. Pointwise was developed in response to very strong, widespread, and specific customer feedback. You need us to increase the tempo with which we deliver new capabilities. Gridgen’s source code and architecture (which we started writing in 1984) was hindering that. You asked for a graphical user interface simpler than Gridgen’s (which we custom coded entirely in OpenGL and haven’t spent much time updating). There never was any intention of taking Gridgen away. This was doubly true while Gridgen had more functionality than Pointwise, which is still the case today (although we’re very close – more on that later.) We understand that for reasons of personal preference, project requirement, or technical capability there are folks who need Gridgen. And those folks will continue to have it. Period. That’s why all our customers get licenses for both Pointwise and Gridgen – so you can choose which one to run. T-Rex is being extended to handle thin surfaces and wakes. 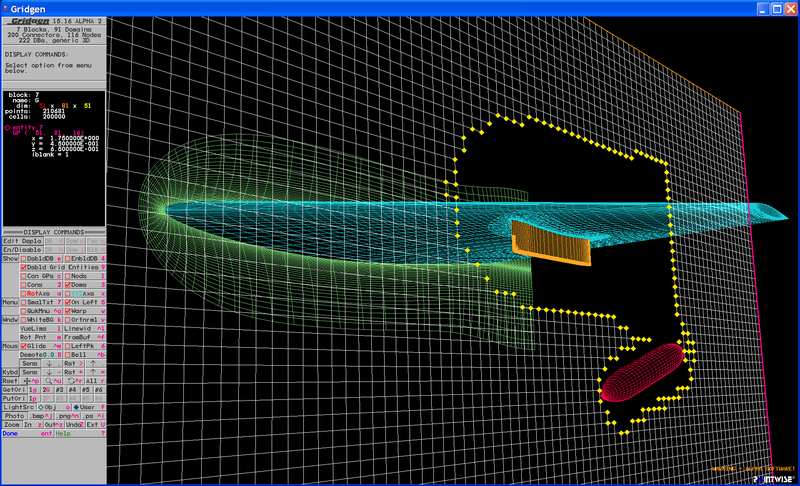 You can read about T-Rex's current capabilities at http://www.pointwise.com/T-Rex. If we’ve done our job right, you’ll want to start using Pointwise if you can. The workflow and interface have been designed to be easier to learn and use, to reduce what user experience people call “excise.” (If you compare connector drawing in Pointwise to Gridgen you’ll see what I mean.) All the features have been implemented in ways that are more automated. And all the while, the grid generation methods will produce results identical to Gridgen. Plus, Pointwise has many capabilities that Gridgen does not. Gridgen is not dead. It’s just like those of us who began its development back in the 1980s – we’ve had to let the belt out a couple notches and we’re not getting any better looking but we still come to work each day and get the job done. Yes, we are the guys who do Gridgen. This entry was posted in Software and tagged Gridgen, hybrid, overset, T-Rex. Bookmark the permalink.